Only two years after the astonishing rise of the Scottish National Party at the 2015 election, the SNP juggernaut seemed to come to a crashing halt. Although the SNP remained the largest party in Scotland at the 2017 election, they lost more than a quarter of their vote share and 21 of the 56 seats they had won in 2015. Conversely, the Scottish Conservatives performed exceptionally well, nearly doubling their vote share from 2015, picking up 12 seats, and becoming the second largest party in Scotland (the first time they have beaten Labour at a general election in Scotland since 1959). Labour modestly improved their vote share by 2.8% and picked up six seats, and the Liberal Democrats managed to gain three seats despite a slight decrease in their share of the vote. What explains these sudden changes in electoral fortunes? We have previously examined how the 2014 Independence referendum lead to the rise of the SNP in 2015 and showed how the political divisions created by a referendum can overrule traditional party loyalty, leading to dramatic changes in the party system. In this blog, we use the newly released 2017 British Election Study Internet Panel data to explore how the interaction of two referendums – on Scottish independence and the UK’s membership of the EU – helps explain the outcome of the 2017 election in Scotland. In a separate blog we also examine the impact of Brexit on the 2017 election in the rest of Britain as well. In terms of party policy, the Scottish independence referendum created clear divisions in Scottish politics. The SNP, the cheerleaders for independence, were unambiguously in favour of staying in the EU, and after the vote tried to leverage Brexit to force a second independence referendum with the aim of keeping Scotland in the EU. 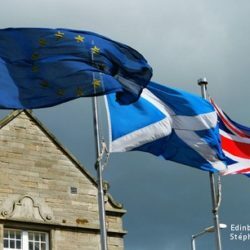 The Scottish Conservatives, united against independence, were divided over Brexit during the EU referendum campaign, but took a clear stance in favour of Brexit following the referendum result (albeit one that is generally seen as more soft-Brexit supporting than their English counterparts). Scottish Labour, also against independence, tried to carve out a position on the EU in between the SNP and the Conservatives. Amongst these voters, whose votes on independence and the EU are congruent with the SNP’s positions, we can see that the vast bulk (about 9 in 10) voted SNP in 2015 and all but a small proportion (about 1 in 10) stayed loyal to the SNP. They also managed to win over the majority of Green voters in this group. In 2015, around 9 in 10 Yes/Leave voters supported the SNP – the same proportion as Yes/Remain voters. Unlike the Yes/Remain SNP voter however, Yes/Leave voters were much more likely to defect from the SNP in 2017, with 4 in 10 switching to another party, with similar proportions going to the Conservatives and Labour. It appears that just as Labour’s position on the Independence referendum lost them votes to the SNP, many 2015 SNP voters were driven away by the party’s strong pro-remain stance. No/Remain voters are the largest of the four groups in the Scottish electorate. In 2015 Labour dominated this group, with around half voting Labour. In 2017 Labour lost about 1 in 5 of these to the Conservatives, with a smaller chunk going to the Liberal Democrats. Smaller numbers of 2015 Conservatives and Liberal Democrats also shifted to Labour, cancelling out some of these loses, and altogether Labour won about 4 in 10 of No/Remain voters in 2017. As a result of picking up a large number of Labour voters, and 3 in 10 2015 Liberal Democrats, the Conservatives increased their share of this group of voters from two in ten to three in ten between 2015 and 2017. Although nationally the Conservatives were more clearly associated with a hard Brexit, the softer approach from the Scottish party, together with a strong position against a second independence referendum and Ruth Davidson’s effective leadership, clearly resonated with this group. No/Leave voters, whose referendum votes are most in line with the Conservative positions on independence and Brexit (post-EU referendum), were almost evenly split between the Conservatives and Labour in 2015 (though the Conservatives had a slight edge). In 2017 the Conservatives picked up nearly half the 2015 Labour voters, six in ten 2015 Liberal Democrats, and the vast majority of 2015 UKIP voters. Combined this nearly doubled the Conservative share of the vote in this group, with nearly two-thirds voting Conservative in 2017. In the space of three general elections, the Scottish party system has been completely transformed. The SNP moved from third place in 2010 to first in 2015 and 2017, Labour has fallen from first to third, and the Conservatives have risen from fourth to second. It is not hard to see how the referendums on Scottish independence and the UK’s membership of the EU have been the catalyst for these changes. In 2015 the Yes side rapidly shifted to the SNP. In 2017, Yes/Remain voters stayed loyal to the SNP but they suffered heavy losses amongst Yes/Leave voters. The relative success of the Conservative in attracting a substantial minority of No/Remain voters (33%, compared to Labour’s 43%) in spite of the national party’s hard line position on Brexit made a significant contribution to their increase in vote share. In contrast, Labour performed relatively poorly amongst the No/leave group, losing a large proportion of voters to the Conservatives. The ability of the Conservatives to capture No/Remain voters as well as No/Leave voters may be partly attributable to their strong campaign, but also reflects the relative importance of the two referendums in defining Scottish voters political identities. We asked a battery of question about identification with the Yes/No side in the Scottish referendum (in wave 11) and with the Leave/Remain side in the EU referendum (based on similar questions relating to social identities) and found that a large number of No/Remain voters more closely identified with ‘No’ than with ‘Remain’ (39%). Amongst this group the Conservatives led Labour by 45%-34%. Among those who identified more strongly as ‘Remain’ than ‘No’ (36%), Labour led the Conservatives 53% to 20%. The last few years of Scottish politics have a clear tale to tell: referendums that cut across party lines can lead to major disturbances in the party system.